Scroll over the image to use arrows to toggle between the Flickr photo gallery. Gen. John M. “Mike” Murray, Commanding General of Army Futures Command (AFC), recently spent several hours on Rice’s campus, touring the Liu Idea Lab for Innovation and Entrepreneurship, the Oshman Engineering Design Kitchen (OEDK) and Moody Center for the Arts with university leaders, faculty and students. 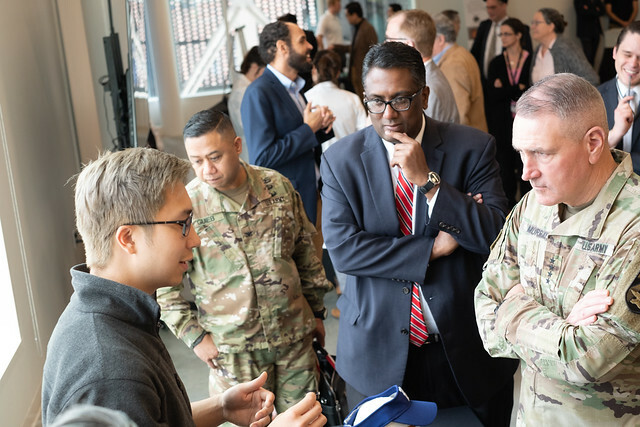 Murray was on campus to learn more about Rice’s research capabilities and how the university and AFC may be able to work together to drive the Army’s research and modernization priorities forward faster. He received a research briefing from Vice Provost for Research Yousif Shamoo, toured the OEDK to see how students prototype against real-world engineering challenges, and saw a technology and startup showcase at the Moody Center. Murray was in Houston for a two-day visit that also included stops at Station Houston, the Texas Medical Center, NASA’s Johnson Space Center and the University of Houston.